Product prices and availability are accurate as of 2019-04-21 16:12:13 UTC and are subject to change. Any price and availability information displayed on http://www.amazon.com/ at the time of purchase will apply to the purchase of this product. 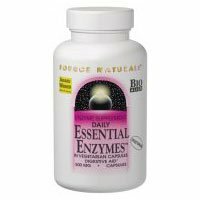 Essential Enzyme is a Bio-Aligned Formula that contains a wide array of enzymes that break down proteins, fats, milk sugar, fiber, and carbohydrates in a wide pH range. It aids the bodys natural digestive process, helping to maximize the bodys utilization of the nutrients in the diet while supporting digestive comfort. Essential Enzymes is now available in convenient blister packs that can be used for meals outside the home.